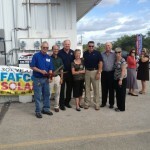 The mayor of Bonita Springs, FL, Ben Nelson, and several other dignitaries attended the ribbon cutting for a 75kW Solar Photovoltaic (Electric) System at Patriot Stor-All on March 11, 2013. 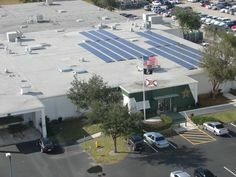 The system is believed to be the largest privately owned solar electric system in the City of Bonita Springs. 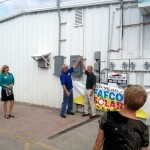 Fafco Solar installed the system on three of ten buildings at the site, which provides self-storage space and small business storefronts. 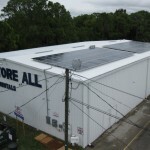 Owner Jim Nickerson worked with Fafco Solar’s Dominick Zito to evaluate the facility’s utility bills and come up with a strategy to use the large expanses of roof to the benefit of the owner. 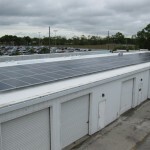 With various incentives, Nickerson will see a great return on investment from otherwise underutilized roof space. 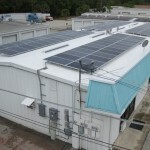 There are three separately grid-interconnected systems comprised of a total of 313 solar photovoltaic modules from Canadian Solar, 313 microinverters by Enphase Energy, and a mounting system by Unirac. 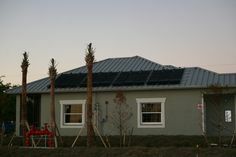 The actual installation was complete in three weeks, with a few additional weeks of design, permitting, and coordinating with officials by yours truly. 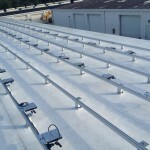 Special thanks are in order to lead solar installer Thomas Gunn, who completed the work on schedule and on budget, and Crowther Roofing who was instrumental in ensuring waterproof integrity of the system on the new TPO membrane roofs. 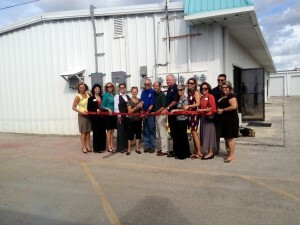 Patriot Stor-All Flip the Switch! 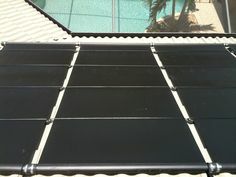 Next Post: The Ideal Pool Temperature – It’s All Relative!